Who We Are. 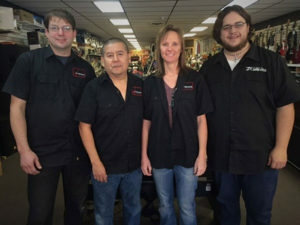 Crossroads Music, a family owned music shop in western Nebraska, was established in January of 2015. We are a full service music store, with locations in both Scottsbluff & Alliance, committed to offering competitive pricing and great service for all your musical needs. We offer a wide range of musical instruments and PA systems and lighting. It is our mission to get you the best price possible, and if we don’t have it in store, we have the ordering capacity to get you virtually anything you might be needing. Our experienced and knowledgeable people will set you up with what you need. We also specialize in, and service, school band instruments and orchestral instruments and offer a Rent to Purchase program for such instruments. A Little History. The owners, Richard and Jeni Castro, are native to the Nebraska-Wyoming Platte River Valley. Both seasoned musicians, they have played professionally in touring bands over the past 2 decades. 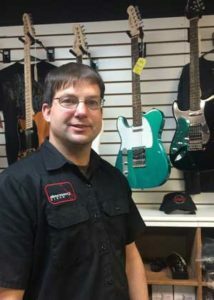 Rich started working at Barbour Music, now Crossroads Music, in 2010. He was instrumental in the growth of the business over the past 5 years. The Castro’s bought the business in January of 2015 and renamed it Crossroads Music. Rich and Jeni know the importance of giving their customers the best possible service they can provide. They also strive to give their customers the best deals possible. Rich gained experience in music retail sales, working at a successful music shop in Minnesota after retiring from the touring band life. He worked there for 8 years, learning the business, and expanding his knowledge about PA systems and lighting, before Rich, Jeni and their two children moved back home to Nebraska. He also gained a lot of knowledge about the many different types of instruments typically offered in music stores. 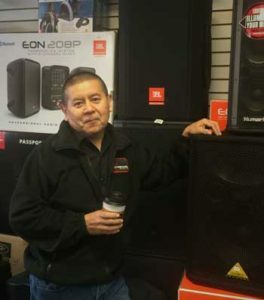 Rich ran a successful sound company in Minnesota as well. Jeni, a talented guitar player, teaches guitar lessons at Crossroads Music. She taught guitar lesson privately and at Central Lakes College in Minnesota for 7 years and has been teaching guitar since the Castro’s relocated to the valley in 2009. Jeni is also our in house stringed instrument repair person. Brett Joined the Crossroads team in the spring of 2015. He is our in house band instrument repairman. Brett apprenticed under the former shop owner(s), who repaired instruments for many years at the shop before, and when it was Barbour Music. Their quality work was well known in the valley, and they have passed on much of their valuable knowledge to Brett. Brett strives to carry on the quality workmanship of his predecessors. Ben has been with Crossroads Music since the fall of 2015. 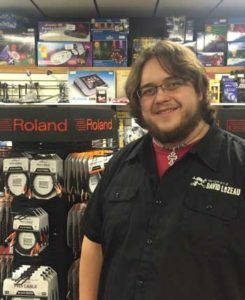 Ben is a valuable member to the Crossroads team, doing light band instrument repair, sales and customer service. He works hard to make sure each customer is well taken care of. Crossroads Music in Alliance offers the same quality and affordable musical instruments and PA and lighting systems and service that the Scottsbluff location offers. If you don’t find what you need at the Alliance location, just ask the friendly and knowledgeable Alliance Crossroads people, and they will help find you what you need. 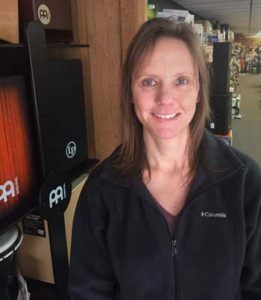 Shon Townsend, Manager of our Alliance store, is a Western Nebraska native, being born and raised in Hemingford, NE and living in Alliance, NE for the past 20 years. He started studying music when he was eight years old, taking guitar lessons for several years at local music store. With a love of music during his childhood his passion brought him to playing a diverse range of music with musician throughout the Panhandle. Shon has played in Christian, rock, country and blues bands; just to name a few. In 1996, Shon transformed his love of playing music to retail and education. 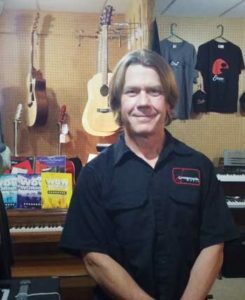 He joined the sales team at local music store in Alliance, NE and after just a few years became the manager, where he has been ever since. His ultimate calling came with educating the community. Shon began giving guitar lessons and has taught countless students of all age ranges for the past 20 years. Grateful for the musical community in the area, Shon continues to be a leading figure in the region and is always willing to lend his musical skills to anyone who asks.